Set the alarm clock and hide somewhere in the house where it can be heard, but not seen. Have all the players leave the room while the "burglar alarm" is hidden. Set the timer to go off in ONE MINUTE and call the players back into the room. 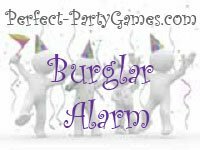 If a player can find the "burglar alarm" BEFORE it goes off, they get a prize. Have several small prizes available so you can play many rounds. Many people come to this site looking for a couple specific games. When they find them, great, the job is done. But there is one thing I want ALL my guests to know regardless of how many or how few pages they read. Therefore, if you see this box again on a few more pages, skip it and move on to finding more games for your event. “Organizing is what you do before you do something, so that when you do it, it is not all mixed up.” These are great words from A.A. Milne, the creator of Winnie-the-Pooh. I couldn’t agree more. And a solid foundation of organizing and planning is needed for most events. But I am here to tell you even with the BEST organization, no event is going to proceed EXACTLY as planned. You may even have a Plan B, C or D as a back-up. That’s fabulous! But trust me on this one; something will happen that you had no way of anticipating. So what now? Here is the trick. Pay close attention to this because it is the single most important piece of wisdom I can share with my readers. That’s it. I could write an entire page on how to “be in the moment” and “have fun at your own party.” But neither of those will happen if you don’t have the mindset that it’s alright to have things turn out differently than you imagined. The good news is that usually what you planned in your head that didn’t come through was never even missed by most. So if you are going along, playing a game, or any other group activity, and it leads you down a road you didn’t foresee… Enjoy the ride.